The Junkers Ju 88 was a World War II German Luftwaffe twin-engine, multi-role aircraft. Designed by Hugo Junkers' company in the mid-1930s, it suffered from a number of technical problems during the later stages of its development and early operational roles, but became one of the most versatile combat aircraft of the war. Affectionately known as "The Maid of all Work" (a feminine version of "jack of all trades"), the Ju 88 proved to be suited to almost any role. Like a number of other Luftwaffe bombers, it was used successfully as a bomber, dive bomber, night fighter, torpedo bomber, reconnaissance aircraft, heavy fighter, and even as a flying bomb during the closing stages of conflict. Despite its protracted development, the aircraft became one of the Luftwaffe's most important assets. The assembly line ran constantly from 1936 to 1945, and more than 16,000 Ju 88s were built in dozens of variants, more than any other twin-engine German aircraft of the period. Throughout the production, the basic structure of the aircraft remained unchanged, proof of the outstanding quality of the original design. The Ju-88A-4 version was one of the more widely used variants, as it was the standard bomber along with the He-111H for most of the war. Supplanting the earlier, short winged Ju-88A-1 version, the A-4 variant was used everywhere that the Luftwaffe conducted bomber operations. The A-4 variant did not see use in the Battle of Britain as that was pretty much the purvey of the A-1 and A-5 variants, but it did see considerable combat in the opening phases of the Soviet invasion in mid 1941. This should be an old friend to many as the Dragon Ju-88A-4 was released in the US in the ProModeler boxing several years back. 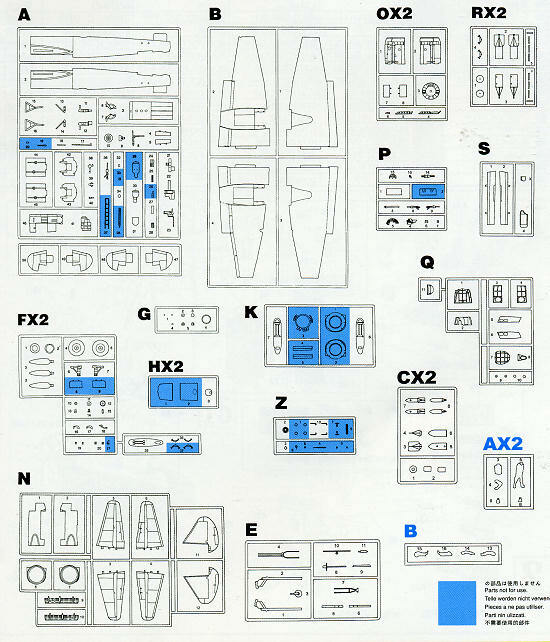 The base kit has also been released by Dragon as multiple variants, with at least a half dozen different kits being produced. 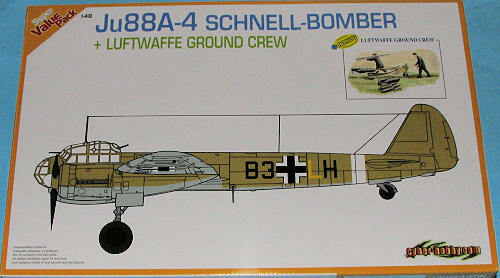 As such, the kit is designed in a modular way so that one can changed the nose section, tail section, engines and wing tips to provide what is needed for the different Ju-88/188 versions. This modularity means that one has to be somewhat careful during construction to ensure that all the various parts will fit. Detail is superb with a most complete cockpit with the usual mass of instruments and radios that were common in the Ju-88 nicely molded. There are the usual external bomb racks and large bombs to put on them. 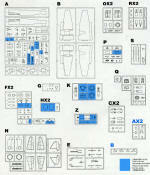 Areas in which to pay attention when building are the installation of the engines on the nacelles and the wing tips. There are no optional bits on this kit as it is the base version from which all the other variants are based. I recommend a set of canopy masks for this one and I believe Eduard does a set that will be most useful. You can find full build articles here in Modeling Madness to help out when it comes construction time. This kit includes a set of ground crewmen with bombs and bomb carts, a nice addition. Markings are for three planes in three different camouflage schemes. The box art plane is from 1./KG 54 in North Africa during 1941/42 in RLM 79 over RLM 78. In a winter wash over the standard bomber camo is a 1./KG 1 plane from Russia in 1943. This has yellow lower wing tips and a fuselage band. From 8./KG 30 based on Sicily and partaking in the Malta campaign is this standard camouflage aircraft from 1942. it has a white fuselage band and yellow lower cowlings. 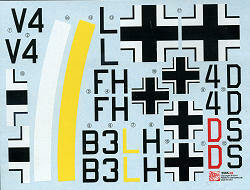 The decal sheet is well printed by Cartograf and includes the fuselage bands. No swastikas are included so those will have to come from somewhere else. Here is a chance to get a great kit and a really good price. If you think about it, this is what you'd pay for a 1/48 single engine fighter or even some 1/72 jet kits. The kit builds well and though one does have to pay attention, it should build quite quickly. Get yours while the getting is good. Thanks to www.dragonmodelsusa.com for the preview kit. You can get yours at your local shop or on-line retailer.